Rental cars are often a necessity when it comes to travel, but it's easy to get taken for a ride. 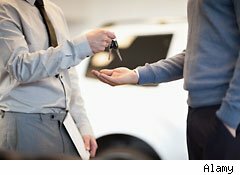 Here, our experts break down some key ways to get the vehicle you want, while landing big savings. First, let's talk about the car. When reserving your wheels, going small can pay off big. Rental companies know that compact cars are less desirable, so they tend to carry more mid- to full-size models. However, if you reserve a compact car and none are available, the company is required to upgrade you to a more expensive car at no extra cost. Next, keep your eyes on the daily rate, as it may not be as consistent as you think. In our example, booking a car for three days, cost a total of $236, which breaks down to $79 per day. Meanwhile, booking a car for a week will cost $364 or $52 per day. Sure, you're paying a higher total cost, but the per-day rate is much lower. So, when booking your vehicle, make sure to check out weekly rates. They may be more economical. Finally, if you see a better deal after you've already booked your rental, don't fret. Unlike airlines and hotels, car companies don't issues penalties for cancellations, leaving you to take advantage of the best deal, hassle-free.